I have been pretty MIA this week, but I have a good reason. Last week, I found that I wasn't able to focus. With a mind that already wanders easily, I found myself frustrated and incapable of concentrating on a single task. Then, one night during the weekend I stayed up way too late reorganizing my cosmetics. And I haven't stopped reorganizing since. A little less than two years ago, I moved to a very small apartment. My little studio has quite a bit of storage for such a small space, but that still isn't quite enough for my many, many things, especially since my apartment also doubles as my full-time office. I have done a lot of decluttering since (I do this every few months, regardless of where I live), but I realized that my frustration came from the fact that not everything had its own place, and that I wasn't happy with what I saw when I opened drawers and cabinets. And this caused me a whole lot of anxiety. I can deal with messy, because that just means I haven't gotten around to putting a few things away. I cannot deal with disorganization. It causes me ridiculous amounts of anxiety and even makes me feel a bit panicked. Considering that I am in my apartment pretty much all the time, I wanted to give it a little spruce and make it a place that was calming and allowed to focus again. Aside from that, I find the process of reorganizing and decluttering quite therapeutic. 1. Declutter. For one of my other gigs, I am a beauty editor at a magazine. This means I get a TON of product sent to me. A lot of said product gets reallocated to friends and family that I know will get more use out of it, or gets sent back to the office where other employees can have some fun with it. But that still leaves me with way more cosmetics and makeup products than I know what to do with. I also realized that because of my terrible storage system, I wasn't making use of everything I owned. I watched a few makeup storage videos on YouTube, and came up with a few ideas. Then, I went through every single product, new and old, to figure out if it was something I should keep, giveaway, or trash. To be honest, I kept a big bulk of it, but was able to unload some nail polishes and lotions that I wasn't using. It also helped me take a mental inventory or how much I owned and the type of storage I would need. I did the same for my jewelry collection, and eventually went through my wall of cabinets to see how much I wasn't using. Turns out, quite a bit! This allowed me to open up space to organize my office supplies, linens and clothes the way I wanted to, instead of items being stuffed wherever I could fit them. 2. Reorganize. In my decluttering stage, I was able to clean out quite a lot of space in my bathroom drawers and cabinets, which meant I could completely reorganize my makeup, skin care and hair care products so that I could actually see where everything was. My drawers are now completely organized, thanks to a few make-shift boxes and already-owned Ikea drawer organizers. I absolutely LOVE being able to open a drawer and see everything that's there without having to sift through items. With the help of a few plastic storage tubs, even more Ikea drawer organizers, and small metal cabinet shelves from Bed, Bath & Beyond, I was able to do the same in my cabinet wall and my kitchen storage. Working from home in a studio apartment means I can see everything all the time. This kind of makes me crazy, especially if things aren't organized. Now, I can look around my apartment and feel a bit more at ease and a lot less suffocated. 3. Sort out my workspace. The last thing I needed to do in this huge re-haul of my apartment was deal with my workstation. As you can imagine, my desk is quite small, so there isn't much room on the surface for anything other than my laptop, agenda, a drink and a candle. I prefer to keep it as clean and decluttered as possible, anyway. It sits against at a corner wall, with one full wall in front of me and another half wall to the left. I already had a few items stuck to the wall in front of my desk, but I decided to add to it to help increase my daily efficiency. I have two colourful, square whiteboards stuck to the wall. I honestly don't use these for much other than to display a few pictures and inspiring quotes. Underneath that, I have a large file pouch where I can store my agenda, press releases and notebooks. On either side of that are two small pails, one full of pens and the other full of markers. On the half wall on the left, I've added a monthly calendar whiteboard. I do use tools like Google Calendar, but I've always been a stickler for writing things down with pen and paper. In my agenda, I can see my to-dos for the week. With the whiteboard, I include events and reminders that aren't part of my regular day-to-day, and I can see it all at a quick glance. Above that, I have a smaller file pouch that currently holds bookmarks and a whole lot of sticky notes. There are still a few minor changes I need to make here and there, but I am pretty happy with the result of my decluttering and reorganization. I feel a lot less anxious, and my mind feels a lot more ready to focus and fly through my to-do list. And my creativity seems to be flowing a lot more freely. P.S. If you liked this post, let us know! 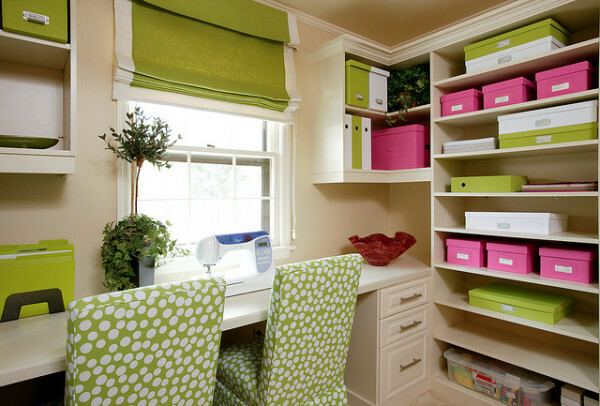 We'd be happy to provide more tips on home and office organization. Also let us know if you'd like to see photos of the end result (I need to replace a few lightbulbs, so the lighting isn't great for photos today).